Oswald Sedman was born in 1896 in Yorkshire. He had two brothers and at least two sisters. He married Doris Holmes, also from Yorkshire and at some stage moved to Rainhill. Oswald went to war with his two brothers, Jack and Bernard. Jack was killed, Oswald and Bernard both returned home badly injured. Bernard had 3 inches blown out of one of his legs and had to wear built up shoes for the rest of his life; he lived into his 90's. Oswald got hit by shrapnel in his chest. The shrapnel apparently moved around and caused him pain. 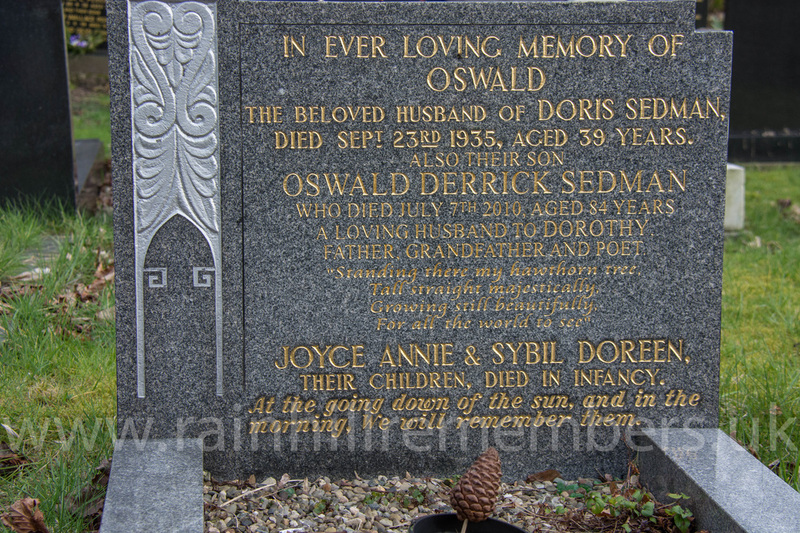 Oswald died in 1935 of pneumonia - causing his widow Doris not to receive a war widows pension. Oswald and Doris are both buried in separate graves in St Ann's Churchyard. Oswald and Doris had a tailor's shop at 582 Warrington Road, Rainhill (where the Co-op now is). After Oswald died, Doris carried on the business as a ladies' and children's outfitters. Later it became a small cottage. His children Oswald, Dorrie and Thomas were all born there and brought up in Rainhill.